Reinhardts Motorcycles is an awesome Indian motorcycle experience in North Tampa. We carry Tampa Indian accessories available for purchase. You will find the best in Indian technical information as well as the ability to service your vehicle. All accessories are installed by craftsman mechanics that have worked at Reinhardts for 15 years or more. Reinhardt himself is always available for your questions or comments. Indian accessories are a great way to claim your identity on Tampa’s asphalt. 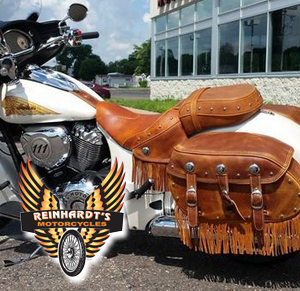 Drive on over to Reinhardts with your Indian and we’ll have your ride fitted and measured for your new gear. Walk ins always welcome; for preferred times call 813-909-2299. 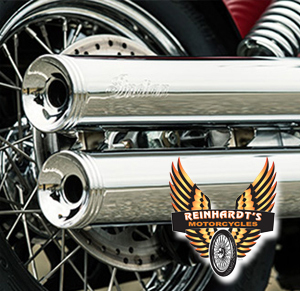 Reinhardt’s Motorcyles is a certified independent Tampa Indian repair facility. We are located on North Dale Mabry in Lutz just south of the 41 split. We are always doing something at our shop so bring your friends and relax for a few. Indian accessories are readily available in shop or custom orders. We carry everything you could possibly want to pimp out your favorite bike. Join the family of amazing individuals that use Reinhardt’s today. Reinhardt’s Motorcycles – The Experts in 2 Wheel Safety. Copyright © 2014 Reinhardt's Motorcycles, all rights reserved.